Time to switch gears and cook up some tasty fish dishes this week after the pasta and other heavier treats of Christmas week just past. 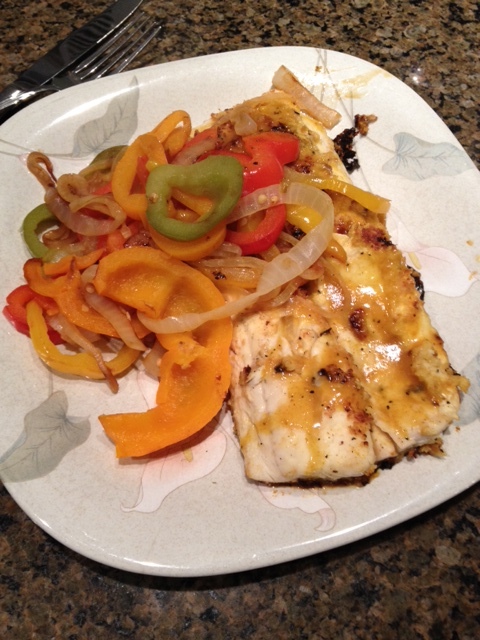 so our 12 Days of low-fat, low-salt, low-sugar meals switches into fish mode for this New Year’s week. 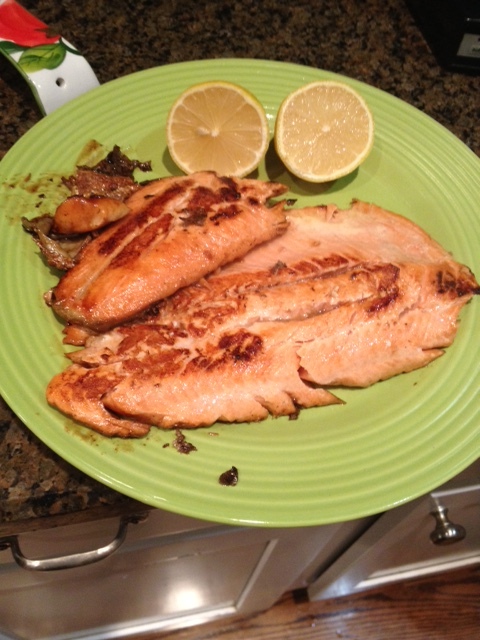 To cook your steelhead, start it in a pan coated with a spray olive oil. Today’s recipe is for steelhead trout, a variety of the ubiquitous trout (at least in the Midwest) that you can get at many local fish counters. 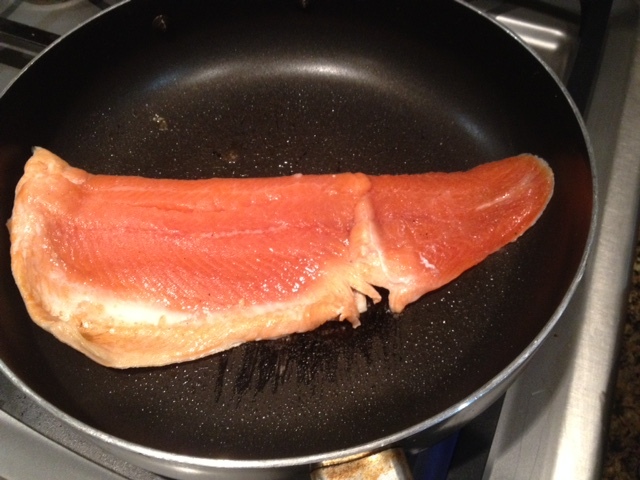 Because of its pink color, steelhead can be confused with salmon but it is trout, so prepare it as such. 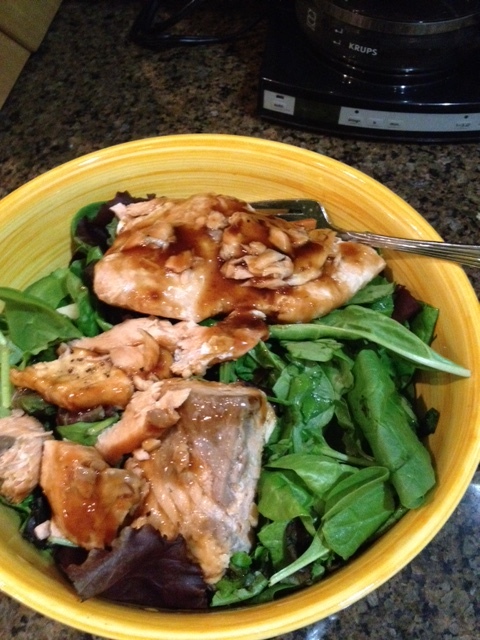 Fry it up with lemon juice for a tasty dinner main course tonight! You made it through Christmas in one piece, congratulations! But you likely still have hungry mouths to feed around you, so here’s something quick and easy for dinner that still fits, barely in the low-salt, low-fat, low-sugar category. I’ve crafted a pizza with a store-bought whole-wheat crust and salt-free tomato sauce along with fat-free cheese. Add whatever veggies on top that tickle your fancy, and you’re ready to go. 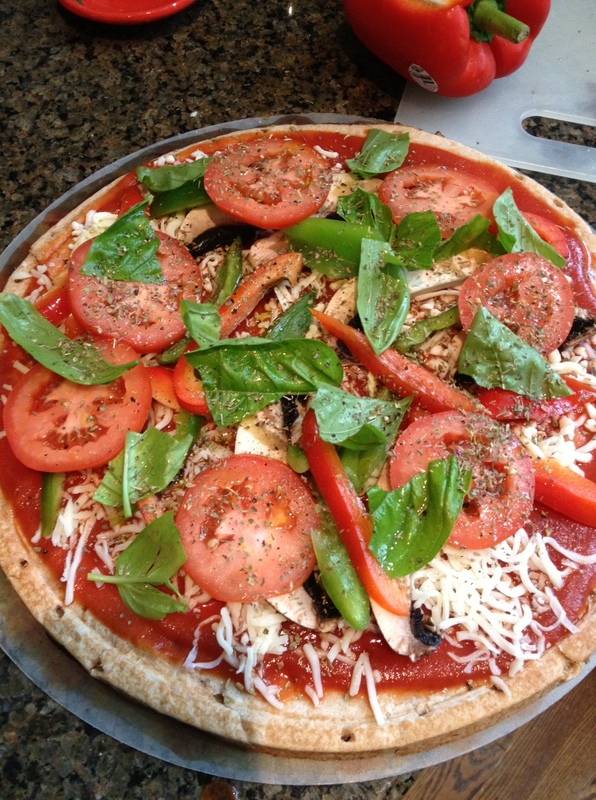 Buy several of these crusts and let guests create their own combination of toppings. 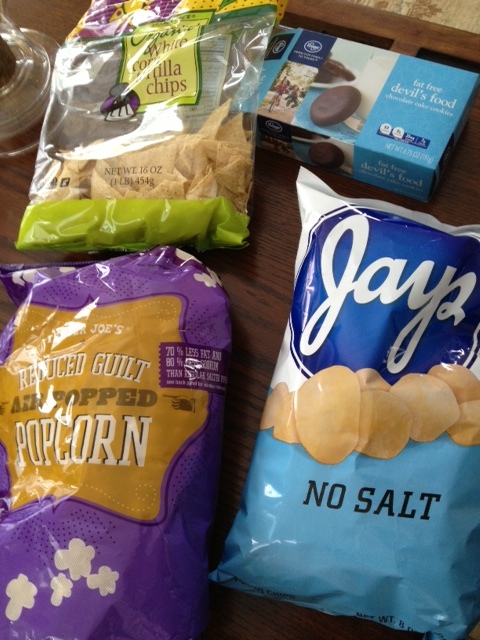 But some low-fat cheese for those who don’t want the no-fat too. You can chuckle about their arteries clogging up after they leave! I’ve come up with a relatively low-salt, low-fat pizza, but any takeout will ahve both too much salt and too much fat in the cheese, even without adding meats. 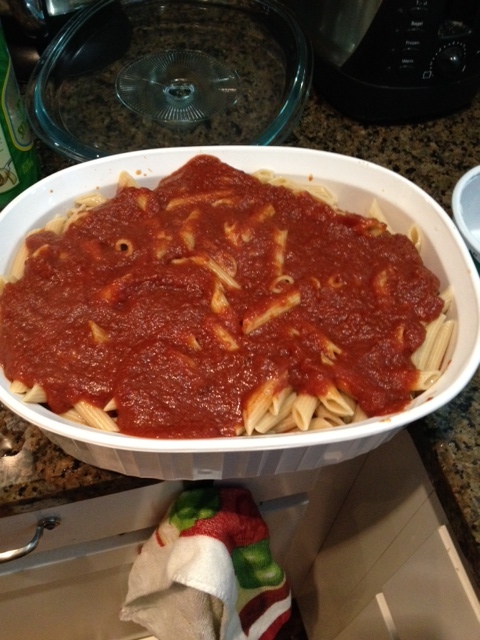 The wonderful smell of tomato sauce cooking on the stove is wafting through my house as I write this post. What better special treat to make for Christmas Day than an Italian pasta dish with whole wheat or multi-grain pasta and low- or no-fat cheese? Baked mostaccoli, or do you call them ziti? For a side dish, make turkey meatballs from extra lean or lean ground turkey, depending on your preference. My 12 Days of no sugar, no salt, no fat Christmas recipes includes two choices for Christmas day, mini-manicotta with low-fat ricotta cheese in them, or baked mostaccoli using the same low-fat cheese. Either will wow your family and friends, and in my opinion can be one of the few meals you make that will truly fill you up. So enjoy, and check my other recipe for this holiday season. Merry Christmas to all my readers, thank you for stopping by! 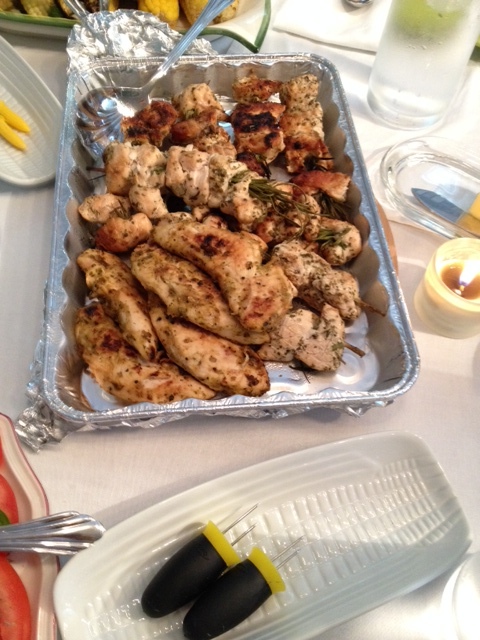 Christmas Eve in the Italian-American culture I grew up in was a time for a family feast of seven kinds of fish. Whether you’re Italian or not, what better thing to make for Christmas Eve if you’re on a no-salt, no-sugar, no-fat, or low of any of those, diet? Fish is low in fat and most are low in salt. If you’ve been reading along, you’ve seen my 12 Days of Christmas recipes lean heavily on fish dishes. 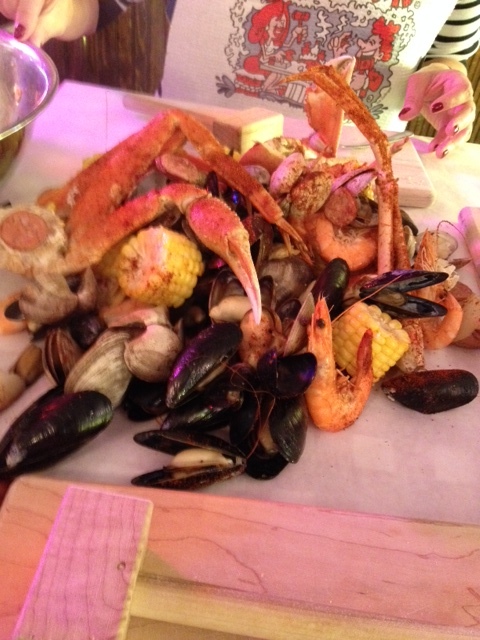 We had this seafood feast at a restaurant in Seattle, but you can make your own at home for Christmas Eve. What are the traditional seven fishes? No one answer exists for that, oddly enough. The answer depended on where people live in Italy as they rely on local fish for their Christmas Eve vigil meals. In that way, they were way ahead of the local food movement only now taking hold in the United States. So see what fish looks good at your supermarket fish counter or local fish store and then use any of the salt-free, low-sugar marinades I’ve written about here. The day before Christmas Eve can be more hectic than either Christmas itself or Christmas Eve. Chances are you still have to go to work and then cook for family and visitors when you get home at night. Or, you’re running around doing last-minute shopping, picking up kids home from college and relatives visiting from afar. You don’t have a lot of time to cook. 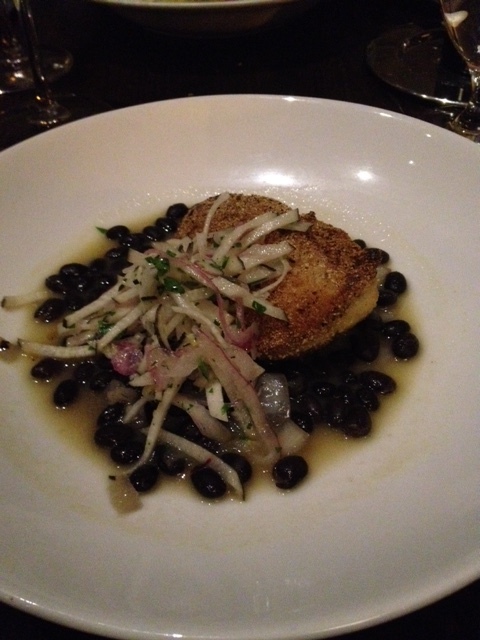 So try a simple tilapia dish. 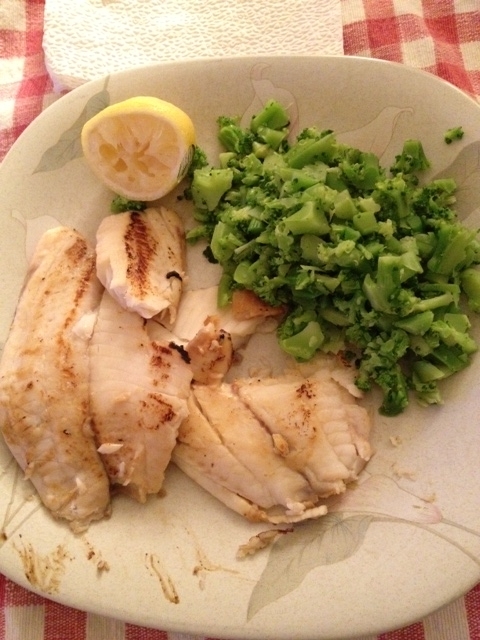 Tilapia fillets cook quickly and you can use a variety of no-salt seasoning mixes to add flavor. Click here to see my recipe. Go with broccoli for a side, make a big salad for everyone too. If you ant get fresh broccoli or don’t have the time to clean it, try frozen instead.